How would you respond if someone asked you, “What do you have to show for your faith in Christ?” Apparently, this is a common question these days posed by those who want to show believers they don’t need the Lord to get what they want out of life. So how do you, a child of God, answer such a question? In this guest post, our daddy in the Lord, Davidson Arinze, shows different ways people respond to this, pointing out the misconceptions of what Christianity is really about that inform such answers. You see, what you think you’ve gained from your faith is a reflection of what you’re seeking. Let me step aside as the man of God explains this better to us. May the Lord promote the writer more and more as he serves in His vineyard and cause the fruits of his labour to abide in Jesus’ name. And to you, dear reader, may your faith be authentic through and through in Jesus’ name. Kindly supply your views on this subject in the Comments Section and share this post widely. You are blessed in Jesus’ name. WHAT DO YOU HAVE TO SHOW FOR FOLLOWING CHRIST? I do not know if you have heard people in recent times, asking this question: “What do you have to show?”, either for your praying, your holiness or generally, for your profession of faith in Christ? When this question or a similar one is posed today, the reference is usually to material and other earthly things like wealth, marriage, children, education and long life here on earth. None of these things is evil in itself. That is why the Apostle Paul describes God as the One “who giveth us richly all things to enjoy” (1 Timothy 6:17). God wants His children to have and enjoy the good things of life. However, the problem is whether or not any of them or all of them should be regarded as “what you have to show for being a Christian”. After John the Baptist announced and introduced Jesus as the Lamb of God which would take away the sin of the world, his two disciples who heard that, left him and followed Jesus (John 1: 35). Of course, at the end of that encounter, it became clear that those disciples desired to follow Jesus for the right reason. Little wonder then that they were among those who changed the world, and also gave their lives for what they believed. Unfortunately, when we talk about what to show for our faith in Christ today, we mean how much wealth one can display as a mark of being a Christian. Well, whereas we must work hard to legitimately make wealth in the most godly way, yet, if wealth is what we have to show for being Christians, I’m very sorry for us, because the wealthiest people in the world today are not necessarily Christians. So, if wealth is the issue, then we have nothing to show for being Christians. Some believe that if someone is a Christian, then, he or she should live a very long life here on earth. Again, while we should practise healthy habits, pray and trust God to give us health and long life here on earth, yet, if having a long life on earth is what we have to show for being Christians, then again, I’m very sorry for us, because there are many people today who live long even though they do not profess any faith in Christ. So, if long life on earth becomes ‘the way to go’ as Christians, then, we really have nothing to show for being Christians. The list can continue! In First Corinthians, when he was addressing the misconception of some Corinthian Christians about the Resurrection, Apostle Paul argued that, if it was only in this world that Christians had hope in Christ, they were the most miserable of all people (1Corinthians 15: 19). In his last Letter ever written, which he addressed to his spiritual son Timothy, fully aware of the sentence of death by beheading which he would soon face, St Paul made it clear that his time of departure was near, and that he was ready to be offered; that he had fought a good fight, finished his course, and had kept the faith. He capped up that information by declaring that, from then, a crown of righteousness awaited him, which the Lord, the Righteous Judge would give him as well as all those who loved or looked forward to His coming (2 Timothy 4: 6-8). Paul was ecstatic that he would soon be with the Lord, which is what he desired all along above anything this life could offer (Philippians 1:21-23). The Apostle Paul was, in other words, saying that he had lived the Christian life and had served the Lord like a soldier on the battle front. That he had met the requirements of the race that was set before him as it were and had finally completed it. And, at the end of the day, he had something to show for it: He had admission into the presence of God for eternity and would receive A CROWN OF RIGHTEOUSNESS! That was what St. Paul had to show for being a Christian and a servant of the Most High God. And that is what everyone of us should strive for as Christians. That should be our goal for serving the Lord, while making the most of whatever life and wealth the Lord has given us here, for His kingdom and for humanity! That is what marks a true Christian: humble obedience to the Master in all things and a longing for the believer’s home on high. “But our citizenship is in heaven, and from it we await a Savior, the Lord Jesus Christ” – Philippians 3:20 (ESV). Another misconception we may have is that unless we preach everywhere like Paul did, we have not served the Lord meaningfully. While we are all called to share the gospel as the Great Commission requires (Matthew 28:19 & 20), not all of us may run ministries or churches, travel to innumerable countries, etc. What matters is that we faithfully serve the Lord wherever we are and in whatever capacity He puts us. And that we do not place the preaching above basic Christian living (being like Christ, bearing the fruit of the Spirit) for which the followers of Christ were originally called Christians (Matthew 25:31-46). May God’s grace abound for all of us, in the Mighty Name of Jesus! Please, if you find this message to be helpful, kindly assist in sharing it among your friends and on various social media. You are richly blessed in Jesus’ name! Davidson Arinze has been in full-time gospel ministry for the past thirty years; and has been with All Christians Fellowship Mission, for twenty-five years. 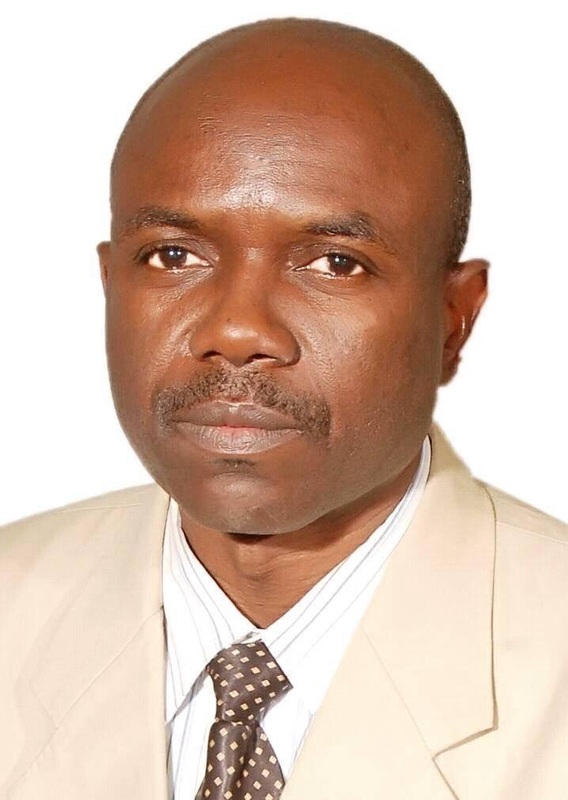 He is a pastor, a theologian and an educationist, by the grace of God and has served as Resident Pastor, Area Overseer and District Overseer in various churches and sections of All Christians Fellowship Mission, Nigeria. A prophetic teacher, preacher and writer, his ministry has touched and transformed many lives and ministries both within and outside All Christians Fellowship Mission to the glory of God. He is married to Mrs Tina Arinze and they live and serve God in Jos, Nigeria with their son, Favour Osinachi Arinze. I have a feeling that "what do you have to show for following Christ?" is one question the devil poses through his agents essentially to mock vulnerable Christians for serving God, and of course to see if they will curse God. Job is a perfect example. The devil was quick to remind God that Job loved him because of His blessings on him: "Does Job fear God for nothing?" Job. 1:9. Yet the Bible exposes Job as a true believer in God. "If in this life only we have hope in Chirst, we are of all men most miserable - I Cor. 15:19". Does this not help to show that no earthly thing is worthy of our Christian calling, and signposts that our hope and all we have to show is Him - heaven at last? I think it does. Meanwhile, I like this clarification: "Another misconception we may have is that unless we preach everywhere like Paul did, we have not served the Lord meaningfully. While we are all called to share the gospel as the Great Commission requires (Matthew 28:19 & 20), not all of us may run ministries or churches, travel to innumerable countries, etc. What matters is that we faithfully serve the Lord wherever we are and in whatever capacity He puts us. And that we do not place the preaching above basic Christian living (being like Christ, bearing the fruit of the Spirit) for which the followers of Christ were originally called Christians (Matthew 25:31-46)." In the end, I find that this piece is correctional, instructional and something in-between. Many thanks for letting us start the Sunday on this note. Enjoy the rest of the Sunday, ma. Glory to God! Enjoy your Sunday too, Ikenna! I agree that sometimes, it's a waste of time to join issues with people on these matters. You're highly blessed in Jesus' name, Vivian! I enjoyed this post Edith. The points highlighted between Christianity and misconceptions bring forth some excellent clarity. In my experience the New Testament is the truth on what a Christian is.In the Gospel Christ shows us the characteristics of a follower. For example in Matthew He used humility (Matthew 7:13-14) as a sign of true faith in Him. In John's Gospel is where the Holy Spirit gives Christians the real meaning of faith in Christ (John 14:15-18). Another great sign of Christianity is in James Epistle (James 1:21-27). James message entails taking Christ's teachings and putting them into action. Thanks for spreading God's truth through Christ. Thanks for visiting, Walter, and for your lovely comment. I thank God for the life of His servant who wrote the article. Blessings upon you and yours in Jesus' name. Following God is not an option, it is a mandate if we know the essence of our existence. I really appreciate this piece because it opened my eyes. Praise God! You are lifted, Nnenna! Funny enough, we don't regard God as anything but in all we do we call him, God is not an option but mandatory for us that call ourselves Christians, He doesn't disappoint because I have tried him several times and I know he will not change in your own time. Good encouragement! Thank you, Juliet, and God bless you bountifully in Jesus' name. One in God is majority, the good Lord always manifests himself in all. There are thousands and millions of reasons to serve the Lord, but the main thing is that he is the essence of our existence. He said, *abide in me and I in you* I think one whom the Lord abides in is pure and holy enough to be called a Christian and justified to follow him for that reason alone. May the good Lord give us the strength to always do the right thing at the right time for the spirit is willing but the body is weak. Thanks ma for an inspiring quote and post. Glad you were blessed, Chinaza! I have always believed that the greatest gift aside Christ in the kingdom is that of Rhema of the word of God because it anchors all our successes and i know the servant of God has really done justice to this topic. Christ was never rich in terms of how much he had in his account but that the presence of God was sufficient unto him. the lack of this knowledge is the controversy of our generation as we try to monetize everything. true wealth and proof of good life is not really measured by our material acquisitions but how much of God we really carry. We don't follow him for wealth but for guidance on the path of truth which has wealth as 'one' of its constituents. my father use to say, "we are not in the town hall because of the meat, but the meat arrived when we were already seated for the business of the day". meaning that the goal is eternal life and the wealth and other goodies are the "other things". so when next someone ask you this question, be sure to defend your faith with the infallible, raw and sound five fold word of God from Daddy Arinze. Thanks a lot, Elijah! You are a true son of the kingdom. Keep the light shining in Jesus' name. Today, materialism and earthly possession of Wealth have been held in high esteem by both young and old. these negative attributes are mostly enjoyed and praised by non Christians. In fact, even in the Church today Bishops, Pastors, Priests are in a competition just because of wealth. Yes! l may not have something to show in terms of material possession, but l know that l have JESUS who is the Ultimate Provider. Yes with Him l have everything l need in life. A lot of people have this misconception that once you are born again and confess Christ as your lord and personal saviour, your problems and difficulties will be over. that was never the case of early Christians and apostles like john the Baptist and apostle Paul, and no such thing can be found in the bible. The only thing that should make Christians happy and give them every boldness, is that we have a better place to go here after. it is a prepared place for prepared people and that's all. That doesn't mean that Christianity always entails hardship. There will be trials but there will be blessings as well. The most important thing is that we don't place physical and material blessings above our spiritual state or right standing with God. Bless you, Solomon! many Christians place material things above their relationship with Christ Jesus......forgetting that the bible said that we should seek first the kingdom of God and every other thing shall be added unto us......."every other thing" and not some things oooo....but so many Christians mis interpret this word of God through their actions, some believes that manner will come from heaven so long as they are serving God this leads me to point out the bible passage that says that "FAITH WITHOUT WORK IS DEAD"
Thank you aunty Edith for bringing this up. Because I've been wanting to clear the airways on this. One thing is certain, majority of people anticipate physical and instant outcomes. Bible made it clear that we are not fighting physical battles, but at war with spiritual powers, principalities and powers in high places. This is a problem only being in Christ can solve for you. It will be interesting to know that answers are not found on the surface, but only available to those who dig deep. let me answer the question. I have Peace of mind, Joy, sound health, faith, assurance of eternity, assurance of the future on earth, Authority over all things. I have Love. Many forget the kind of father the christian s have. Like he just loves me for no reason. I am co-heir in Jesus. A best friend I can tell Everything... Need i go on? LOL i ended up counting my blessings. Thank you ma for this platform. The above question is very simple but difficult yi answer by most Christians.. . possession of wealth is very good but placing that above our christian focus (Christ & heaven) is where d problem lies... My continual struggle to be good & faithful to my Christian promises are what i have to show.. Am really impress with the piece, because it reminds me of who i am as a Christian. this passage is ministering to me right now and i have just realized that the love of God that dwells in me is what i have to show that am following christ coupled with the fact that his presence gives us unending joy, happiness and life fufilment. Thank you for sharing this powerful spiritual message. Every child of God has something to show as a result of following Jesus. Following Jesus does not mean that life will be rosy. Some people might claim that they don't have anything to show but this is usually as a result of people focusing their minds on negative things. we as Christians have a lot to show for following God is it good health, peace, wisdom, life and so much more, we should learn to obey him more because by doing so we gain a lot of favour from him. some are in the hospital breathing with oxygen but we are here breathing free because he loves us. Both the poor and the rich can serve God,what matters is the heart you are using to serve him. are you taking your wealth more important than God?, then it is an idol to you,which does not portray a good christian,one can still be rich and serve God diligently. its a matter of choice, we ask for grace to stand on the right choice. Truly uplifting, may God's love and light shine through us for the world to see. I am personally blessed by this piece as it is like an eye opener to what lies in being a christian. Earthly possessions are good but this is not what the kingdom of God is all about. God is faithful and provides us with all our needs, we do not need earthly properties which are bonuses added to us as his children because christians are rich too but our stand in him cannot be measured with this. He is and will always be and his righteousness and faithfulness keeps me rooted in him. We as Christians should show the world that we are the children of God who lives in heaven and in heaven where he lives, we must aspire to be with him. Christ told us that there is no profit if you gain everything in this world and lose your soul. "But seek first the kingdom of God and his righteousness, and all these things will be added to you"(Matthew 6:33) God bless you, mum! In today's world, many Christians place material things over God. Even when they are praying, their prayer points is always centered on God bless me. They forget to thank God for what he has been doing so far. This is a wonderful piece worth sharing. Thank you, ma. It does not matter how long you live here on earth be you a christian or not, what matters is what did you live for. Christianity built on a shaky ground will always fall for the kind of discouraging and devilish question. Perhaps, one asking this question do not also believe in the self less sacrifice our Lord Jesus Christ did on the cross for our sake. What also do he have to gain by dying for us? Faith itself is a virtue! The innate consciousness of a supreme being who made man and to whom he is accountable on, is more than enough to get me more attached to him. I encourage them to also ask themselves what they gain from been human? The life I leave is not my own, the air I breath day in day out which is where the hope of having a new beginning lies is so much to boost of in counting the benefit I have have in appreciating God. May the Almighty Bless his words in our hearts and increase our faith to overcome trying times and every obstacle in our life. Very nice!! I really learned a lot from this post. We should not just follow Christ for material things but rather follow him because at the end, we would be admitted into God's presence and then be given a "Crown of Righteousness". Also, if we follow him just for the sake of material things we are likely to gain from him, by the time we receive these things we may stop serving him faithfully. It was also nice learning that we can faithfully serve the lord even without going from place to place, preaching the gospel (evangelizing). But we still need to preach where'er we are. Its not just about serving God, its all about serving him in truth and in spirit and having the baptism of the holy spirit. Thanks Ma'am for sharing. This is really a great message from Pastor Davidson. At first, when he probed that question 'what can you show for following Christ', what readily came to my mind was my admission this is because i really prayed for it. but as i continued reading, i realized that my achievements here on earth should not be the only basis for following Christ. but that I should rather seek a better relationship with Him here on earth and look forward for that crown of life. God bless you Aunty Edith for sharing this wonderful piece with us. Being a Christian comes with abundant packages, including peace, joy, hope in this life and the hereafter. And most of all Divine love and protection. Nice post. Christ has given us the word which is light that no darkness shall comprehend, with this word one has a lot because a sick can be healed by this word, blind regains his sight and as well mountains are commanded with this word. so Christians are children of God and they have a better place to spend their eternity after life on earth. Everything is not centered around money or material things. God lifts us in ways we cannot imagine. It is best for us to look away from the shadows and seek the real deal, which is the Face of God. If I had attempted to answer the question, without reading through the piece, i would have given the wrong answer. This means that Iearnt a lot from the post. It is Instructive, Informative and educative . Thanks for Sharing with us, Ma. Of course, I have something to show for following Christ because my life is redeemed and I'm not condemned again, wealth, long life education, marriage and other earthly achievements are good but cannot of anything to show for following Christ. Thanks to the Big Daddy in the Lord. Seriously speaking, I feel this is a call for readjustment cos most of us live our lives without the Christian identity we should have. "What is it I have to tell Christ I did while on earth?" Has also been a disturbing question. And like Apostle Paul, how do I ensure that the good fight of faith is fought, to honourably await the crown? Hmm! Thanks Ma. Thoughts fill my heart. THIS STORY JUST REMIND ME OF ONE OF THE THINGS I WANT TO ACCOMPLISH IN THIS LIFE, WHICH IS TO TRY SO HARD TO LIVE UP TO BEING A CHRISTAIN BECAUSE BEING A CHRISTIAN IS NOT ALL ABOUT GOING TO CHURCH, I WANT TO LIVE A CHRIST LIKE LIFE, FULL OF FAITH, GOOD DEEDS AND LOVE FOR ALL, ALTHOUGH I KNOW THE JOURNEY IS NOT AN EASY ONE BUT GOD WILL LEAD ME. Being a christain who practise what he or she hears and still stand boldly to affirm him as the lord and personal saviour in the midst of transgression is not a easy task. But truly as christains what can we show forth in our service rendered to God? What our spiritual achievement so far? Are we the types surrounded by the unsaved yet we havent mention God to them? What can we truly boast of as christains? Thank you ma, cause i learnt that its not about chanting to the world that you are a christain but about them seeing your deeds and proclaiming the truth of you being a christain. That by two immutable things, in which it was impossible for God to lie; his promises are ever sure . The bible says in Matthew 24:35 KJV Heaven and earth shall pass away, but my words shall not pass away. There is blessing attached to serving jesus. which only those who have answered the call of salvation will attest to that. God bless you ma. Nice One. What I understood from this piece and what I believe is central to it, is that Things that are Universal cannot be used to show for following Christ. This is because they are applicable to both Christians and non-Christians alike. Thank You Ma, for sharing this message with us. God bless! Thanks for this piece ma! We shouldn't just follow christ because of the material things we THINK we can gain from doing that. We should sincerely follow him instead, because in him is eternal redemption and salvation. What will you answer if ask what you have to show your faith in Christ. Is a very good question because most of us don't know what to respond. Some believe that the fact that they are Christian means that the have faith in God. But have nothing to show for it. But it is not so because it is something that comes from within (you). Being a Christian is not just by saying it but by living it. As Christians, our thoughts should be not just be based on what we want to receive but also what we wish to give. Christ is not meant to be toiled with, if you open up your hearts to him as Christians,he comes to dwell in it, but if he does not have a place in your heart, and you say you're a Christian, you are only deceiving yourself and wasting your time, what does your faith in Christ Jesus tell about you. Thank you Davidson Arinze for sharing this piece with us. am elated by this post. as a believer i have a lot of things to show for being a believer. one is my creation by the creator who made me (a human [his most treasured creation on earth] and not an animal), another is my faith in him which i got consequent upon his death for me on the cross. another is his love in my heart which the holy spirit renews day after day and the hope of being in a city after death which no country on earth can be compared with in terms of beauty, riches, satisfaction and whatever man desire, want or need in life. i have power in Christ beyond the natural to conrol dark, satanic and opposition forces that antagonise human efforts on earth to mention but a few. having all these and more in Christ, i show them to people to prove that my faith is built on things beyond the natural. thank you Pastor Davidson and Aunty Edith for a timely message like this. it is more that a post. Thank you for this wonderful piece. It is the plan truth. I notice most times in church the rich, influential ones are asked to seat at the front seat. Even if people are sitting there they are asked to move for the rich to sit. Now this traces it back to the same question "what do you have to show". As a church is it wealth that we have to show?. This is a prominent problem in various churches. I have an experience. Sometimes in church, when we have a fund raising programme, the congregation would laugh and scream when they hear someone donate a huge sum. When an old woman or ordinary individual drops a token like a thousand naira. You would hear less or no applause. By following Christ, I have assurance of spending my eternity with Him. Serving and worshiping him in truth. Being a Christian is one of the hardest thing ever. Temptations arises, but with faith in God, we can overcome all things. Many people have different reasons for following mad believing in God. Some don't. But when you want to believe in God. You should have the heart of a child.. Whatever happens happened for his Glory. We should believe in God without conditions. This is a great piece. I have learned and had a deep thought of my christian life. This piece has given me a new revelation about true christian. The world we live is made up of both christian and non-christian with their views of personality. The non-christian wants to show they exist based on the amount of earthly things they possess while a christian who do not well understand what Jesus Christ demands from us, will find his/herself competing for these earthly things in order to show they have a God. Many christian has grown with this wrong believe but thank God i have been taught and others what should be our standard and values in this world we live as a christian. I believe that we christains should live a life full of God's presence. A Christian life should show God's glory and faithfulness. God is the essence of my existence,so i see no reason why I should place earthly possessions over the things of the kingdom. Many christians today tend to make such mistake. I have a lot to show for following Christ, numerous of them and I believe that if God can do it for me then He can do it for many. True Christianity is that personal relationship with God and it's manifestation in our character. By their fruits you shall know them. Following God is a mandate not an option. We live for Christ and as such we should follow in his footsteps to be able to call ourselves true believers. Today most Christians serve the lord with earthly desires in their hearts, this is totally wrong. We stand to gain more than that when we serve the lord wholeheartedly. What we gain is eternal life in heaven, a place of no sufferings an pain. I look forward to this as a Christian. As a Christian we do not need to tell the word that we followers of Christ with words, rather what is need to tell the world that we are follower, should be our character, our character reveal our personality. So if we have Christ inside of us that means our character would tell people we are followers of Christ. Worldly possessions doesn't show you are following Jesus Christ neither does a life full of hardship, trials would surely come but this question begs an answer of we cross-checking our lives because it is our life style that shows we are true followers of Christ; those little deeds of kindness, those depressing persecutions we overcome by his grace etc. I am really short of words ma because this is really what I need right now.I puzzled and stared at this question for some minutes and asked my self sincerely what really I will show?.what is my goal?as a christian. Thank you ma for making me know that it's bot all about opening a ministry but I can actually talk to my friends and people around me about Christ. A true christian life should be reflected in every area of one’s life. It should be seen in our every actions, deeds, and lifestyle such that wherever we go or find ourselves, people see it first before we proclaim it. It is a pity to note that many who profess to be Christians are no different from those who are yet to receive Christ. I wonder how they get to reach out to those who are not yet saved. Since I became saved, I have noticed so many improvements in my life especially in areas I struggled with all thanks to God’s grace that is made available to me. Following Christ is not all about seeking material things.Most people feel that as Christians things has to be rosy and go according to our wish forgetting that believers even face worse trials.There are more advantages to gain when following Christ other than material things.Tue Christianity should however be reflected in our deeds,life style ,actions ,our approach to issues and then how we struggle to enter His kingdom. Inspiring! I think am a victim of such misconception as i always think that because I am a christian,money,fine cars and good houses are marks that must follow me as a sign of being a christian, but i am made to understand by this post that that is not the ultimate aim or a sign of being a good follower of God.No wonder the Bible says"If you be risen with christ, seek those things which are above" and this implies that having heaven in view and winning lost souls for the master and the kingdom is a far more greater show-off of a christian man/woman. More Greece to your Elbow Ma, for this platform of reading the word of God free of charge. I have gained a lot from following Christ but that's not my Joy... My joy is knowing there is someone who loves me unconditionally and would never let me down... Our purpose in following Christ shouldn't be based on the benefits only but because we know he is lily of the valley, the bright and morning star.. The one who does impossible things... The one I call my Father... My life is one thing among many others that I have gained from following him and i'm forever grateful for. Being a christian and living the faith is not an easy thing all we need is to ask God for the grace to keep up the good work. Thanks ma for this wonderful piece. Being a christian and living the faith is not an easy thing, it does not even depend on wealth all we need is to continue asking God for his grace to keep up the good work. Thank you ma for this wonderful piece. I have learnt that sometimes Christians experience challenges and bad times which their neighbors who are not even born again do not experience. this does not mean that their Christianity is in vain but we should not measure our Christianity by the worldly things we enjoy but by the various spiritual elevation and eternal hope in Christ. that we are Christians does not mean we will not have troubles on our way but Christ has promised to give us the grace to overcome the temptation in the world and emerge victorious. i have also discovered that a Christians enjoy many spiritual benefits which is also accompanied by physical blessings and that if we want to count our blessings in Christ. we have many things to show for it. lol. This question sounds more like a mockery question from people who have amassed earthly things but do not believe in the existence of God. well, a true christian is not obligated to display the benefits of his faith in God to anyone. There is more to serving God than just gaining material things. However because the Bible says 'seek ye first the kingdom of God and His righteousness and every other thing shall be added unto you' does not mean that after giving your life to Christ, you now relax under a tree and wait for wealth to fall from heaven.You have to work and the Favour and Grace of God would locate you. If you are asked this question, be sure to hear from the Holy Spirit before you speak. Sometimes, silence is best. Exactly, when people try to show for their faith in christ all that comes to their mind is wealth,it is not supposed to be so just that the world we live in today has become so materialistic that people place little focus on religion.As a child of God, when we are asked such questions,what should come to our mind is our achievements through christ; how many souls we have won for christ,how many times we successfully carried out evangelism and our miracles and breakthroughs.nowadays christians are lost in the world chasing material things and forgeting the main goal which is heaven,God help us in this christian race. Serving God is not an option, it is a must if we know the reason of our existence. I really appreciate this piece because it exposed me to a whole new dimension. Every christian is suppose to always ask this question, What can be remembered for?, what will I tell my GOD on the judgement day?, will he be happy with me?, what will i show HIM? , these questions and many more. sometimes I get scared and sometimes I ask myself these questions. this is just like living school, what will i show to my parent who sent me to school, will they be happy with me or not. Every good christian, who believe and fear GOD should always serve him, we should do things that will glorify the LORD, do things that will make him happy. Every human must give an account of the life we live after here and sometimes I ask myself what account I will give. Christian are to live by example and do things that pleases GOD. "What do we have to show for it?" We should not be weighed down by people's comment about our life. Instead we should be more concerned about God's thought about the way we live our life. In essence we should think more about the heavenly rewards of our good deeds rather than the instant rewards we would get. let your light so shine among men that when they see your good works, they'll glorify our Father who is in heaven. When you're living a life pleasing unto God, you have everything to show for following Christ. This is another crucial question that normally arises in the midst of Christians even between believers (Christians) and non believers (non Christians). And apostle Paul has made it clear that the accumulation of earthly things or how long one lives on earth is not what makes someone or the criteria of being Christ’s followers but according to him is humble obedience to God. Apostle Paul was also, saying that he had lived the Christian life and had served the lord like a soldier on the battle front. That he had met the requirements of the race that was set before him as it were and had finally completed it. And, at the end of the day, he had something to show for it: he had admission into the presence of God for eternity and would receive a crown of righteousness! Hence this is exactly what Christian should hold unto; it is what all Christ followers should display. On the judgement day, what do you have to show for the life you have lived, most times we as individuals in general do not think of the last day when we do things, i believe that we are given life to serve God and make him happy by being kind doing his will and sharing happiness. However the way I relate with God is between I and God. I have been redeemed by his agony, therefore I'll boost and swing my shoulder high for having God in my life. Good relationship with God is really important in our lives. Let's all live to glorify his name, Amen!! I will try as I can to show mercy to the people. Preach the good news of the Lord. Help the aged people by carrying out those functions which they may find very difficult to carry. Always praise God and worship God everyday doing what God expect from me not minding people who are poke nosing. Ma is a very nice article to apprehend, God bless u very much for this. The only way you can show you're following Christ or a Christ lover is in your attitude towards him and his works. You cant truly love someone without spending time with them and making them feel or know how special they are to you. We could talk to people about Christ and spread the gospel because this is the only purpose of the church. We were called Christians for the first, not because the word had been in existence; but because the then apostles (disciples) possessed the attributes of Christ, the saviour. We were called Christians because we behaved like Christ. That is to be mean that Christianity ought to reflect in one's attitude, else there's absolutely nothing to show or prove yourself as one. This question is often posed to mock people's faith. Due to materialistic nature of our world of today, people measure everything with wealth and possession but a true christian live to please the father just like the pastor has rightly said. The crown for all our effort is not here on earth but in heaven and so i concurred when Paul said that God is about give him a crown of righteousness. Christianity, to some, is an avenue to blanket their hidden, evil deeds. Some claim to be Christians, yet their attitudes, their relationship with those around them says otherwise of them. I ask, what is this word "Christianity" all about? Is it just a name a particular group calls themselves; is just a belief or is it a religion that ought to influence our attitude and relationship with people around us? As Christians, we must encounter trials because following Christ is not an easy thing to do, we only hope on His grace. Thanks MA. All that can be used as a evidence to prove that truly one is a follower of Christ is one's attitude and relationship with others around. otherwise,how can be claim to be Christians when Christ's Attitude, or rather, Teachings of Christianity is not reflected in our behaviours? it is not about wealth and earthly material like the rich man in the bible .this question is what any body that calls himself a believer should ask and answer himself.the evidence of following christ is being like him lacking nothing. Like you said ma, this is a very common question put to believers. Thank you very much for sharing this message by the man of God. I don't know for others but this got me thinking and has gone a long way in making me change my answer when asked this above question. Truly indeed, show of earthly possessions or long life is not enough to show for following Christ. what do you have to show for following Christ is a very nice write up that put believers in a thinking state of what the lord has done for them. some believers think that the material things they have is what they have to show for following Christ, but waking up everyday is enough to show that the lord is good in our lives, ill like to recommend this write up to both Christians and non Christians in order for them to know the true meaning of following Christ and the reward that follows, thank you ma. Many people cant answer such question because they think its about answering the name Christian. Christian is a name and Christianity is a religion but that does not mean its what you should show when asked such question,rather it shows in your life,people should testify about your life as a Christian. bless you sir. It is so unfortunate, that man do not know the importance and what it means to serve God.To serve God is not an option but rather a mandatory aspects of man existence.Therefore, serving God is beyond going to Sunday services, it is a personal relationship...God's Grace to Christians. Thanks Ma for this piece. The only thing can be used as an evidence to prove that truly one is a follower of Christ is one's attitude and relationship with others around. We must follow Christ's teaching of love, peace, good relationship etc. We must be true followers of Christ and it must be portrayed in our behaviours to people.... Nice peace MA and nay God bless you abundantly!!!!! Christianity is living the christ life. Do's and don't which Christ would or wouldn't have on earth. When we see christianity as a religion and not lifestlye, we follow methods to please fellows. God helps us.. IT IS ESSENTIAL THAT WE DEFINE THE PORPOSE BY WHICH WE FOLLOW JESUS. THIS IS NECESSSARY BECAUSE A LOT OF PEOPLE ONLY CLAIM TO LOVE HIM BEXUASE OF THE BENFITS ATTACHED TO IT. There is a certain peace of mind and harmony we have when we have christ. Having Him doesn't necessarily have to show materially. We glow spiritually and that is the most important thing. We shouldn't use material substances to justify our followership with Christ. As Christians,we are not suppose to let such questions trouble us.it is clear and obvious that life outside Christ is crisis. When we have Christ,there is these joy that comes with it which money can not buy.material things shouldn't be associated with Christianity because its vanity. The bible made us to know that is better to suffer with Christ to enjoy later. Some who claim they are Christians or rather call themselves Christians do not really know why they serve God. Some are Sunday church goers who look for one miracle or the other or even material things. They don't think about spirituality or bother about what it takes to have Christ in spirit and in truth, they think Christianity is about always seeking for fortunes at all times instead of emulating or leading christ-like lives. Christians should always live a life that tend to mirror or project Christ in them. When we have Christ in us material things are just not our priority because having Christ gives us all we want, material benefits is not a reflection of our fellowship with Christ rather its our lives. Following Christ is something Christians should do in view to eternal life. What will it profit a man to win the whole world and loose his soul? When we follow Christ in truth and in spirit, he enables us to share in his glory by giving us the privilege of sharing in his suffering, joy and resurrection. Any Christian who equates his following Christ for earthly benefits is not a true Christian..
What do you have to show for following Christ? According to apostle Paul in the scripture he said I fought good fight, I finished my course, kept my faith and await a crown of righteousness from God. My question is how many of us can stand and defend our faith, how many of is including those men of God, can we boldly stand and declear our believe, faith and stand by it. Gone are the days that Christians are Christian. This generation are full of hypocrist not minding the number of churches evolving everyday. Can we still see the three Hebrew men in our midst in this generation of mankind. May God help us. Am pleased with this write-up. Following God is to fulfill our ministry on earth. He primarily created us to serve him However, serving God is not an optional, it is a mandate to every living soul. Bless you ma. The message is a very nice one. As Christians, we are expected to show and live out a life distinct from the world. We should take it seriously enough to understand that we are a chosen people in this earth for a purpose- to be the light of the world. The post is an inspiring one. In various human endeavours on earth, what separates Christians from unbelievers, is their way of life- how they live their lives. If Christians truly know who they are, they would have to show something for being Christians. As Christians we all believe that God is our creator and following him is something that every Christan must do without attaching anything to it.God loves us so much, we don't have to show anything for following him, we just have to bear it in mind that we have reward in heaven for following Christ. Thank you ma for this inspiratonal post. Our ceeator created us for a purpose, it is either you are growing or you withering and fading away. As Christians we are subjected to showing forth the image of us in us and shining the light of God in us. We should be able to seperate ourselves from unbelievers through distinctive characters,we must fight a good fight so that at the end, our work will be counted. May God help us in this Christian race till the end! Thanks a lot for this inspirational post ma. This post made to understand what a true Christian should stand for. A true Christian is someone who lives God dearly and is willing to serve him for the rest of his life. Wealth or long life doesn't show that you are Christian because, both believers and non-believers enjoy wealth and long life. As Christians, we should serve God all the days of our life in the best way we can. God loves his children so much and there is a big reward for those who serve him all the days of their life. This write up is really didactic. What really shows that one is a follower of Christ is how much faith he or she has. How he or she lives her life should be totally different from how an unbeliever lives his life too. A true follower of Christ should always live an exemplary life. Serving God shouldn't be an optional thing, it's mandatory because God in his own image created us all. We should always serve him. The only thing we can show in serving God is our way of live which distincts us from unbelievers. What do I have to show for following Christ? This question is a ploy from the devil to trick the children of God into questioning their faith in God, Judging from the fact that so many Christians are not even sure of their reason for following Christ. Truly, we do not serve him for earthly gains or for long life but we serve him because that is what he asked us to do. The only reason God created us is for us to know him, love him, and serve him on earth in order to live with him in eternal joy in the life to come. That is why he said that we should seek first his kingdom and his righteousness and every other thing shall be added unto us. Those other things are like a bonus to us to sustain us and prepare us for that which we shall enjoy in heaven. The only thing we have to show for following Christ is the crown of glory which he will give us on the last day. that is our reason for following him. This is really interesting, as a Christian we are to beer in mind that we are not of earth...... Our hope,that is what we have to show as Christian should be eternal life because the world is life a market,which after everything we have a better place to go........we should pursuant of external life not earthly things. What i have to show for following Christ is by first of all learning to be His disciple by learning to have faith and trust in Him, being with Him, learning to obey Him. God bless you sir, some people think that Christianity is all about abandoning these resources God has used to bless the earth, No. It is all about using what you have as earthly possession to gain the kingdom of God in heaven. More so, let people know your faith in Christ by the kind of life you are leading.Therefore, your slogan should be " Faith in Christ, service to humanity. " Christianity is not just about wealth, long life, fame or popularity rather it's about the value you impact in lives. Long life, wealth, fame etc are bonuses added to a Christian's life. Following God is necessary because without God we are nothing. I have really learnt something from this post. When we follow God we receive salvation and we are not condemned. This enables us to be true Christians and believers of Christ. Thank u ma for this lovely post. What a wonderful post ma.there is enough to show for following christ.when we live our Life's according to the principles of God there is a reward,which is heaven at last.To be wealthy is not bad at all, but using it as yardstick to measure what we have gained from following christ makes it wrong. They is no joy or gain better than the joy and peace of mind given to us by God as sign of our commitment and dedication to his services. When people are asked what they have to show for following Christ, they feel its all about material things.... What about the things that are not materialistic? What about your spiritual life? What of the fruits of the spirits? Are these not things that need to show that you're really following Christ? I pray for us to have understanding about the things of Christ. Following Christ is not an easy task so as other good things. But with Christ you are rest assured of living with him in eternity. What then do you have to show? We should not think about only material things but also spiritual blessings. When we serve God, most times it is out of duty to our parents and tradtiiton to our families. Serving God shouldn't be because of all that. I've learnt that we should put our eyes to the price which at the end will be a reward unto us. I've learnt that following Christ doesn't always mean we would have to preach round the world like Paul and some great men of God did and have done. I've learnt a great lot. Thank you Ma. This is always my heart cry to see Christ at the end of life.Amen.God bless you ma for this write-up you shared to us. We should not crave earthly or material things as the main reason for our following Christ. These things will come abundantly as our Father always blesses those who serve Him faithfully. Wow! !this is a nice piece, is just stating that Christianity is not all about showing off material things but to ensure that eternity is secured in heaven because that is the only thing we can show not our material things..
Fabulous post. Indeed earthly achievements are not enough to show for following Christ. Our prove for following Him is the lives which we have established in the heavenly kingdom. Bless u ma. I really like this story, reason, some many people claim they are christain, they love christ, but whenever you talk about suffering for christ, they will go back, they will tell you that christ has suffered and died for them so no need of suffering again. God said if you love me do my willbut when we are told to preach and carry our cross it will become a heavey task. am not saying this because am perfect or d0ing all but am saying this evem to myself. we all claim we are christain but there is no different between us and others. Beautiful Post. Some Christians often follow God because of the riches and so on. We should as Christians serve God with our whole heart mind, body and soul, serve him faithfully and other things will be given to us. What do u have to show?this is a tricky question posed by the devil for us to rethink our faith on Christ.Our rewards might not be material things.serving God could bring about things like peace of mind,inner strength to face life's challenges, good health, joy,favour from men n God but the ultimate reward is in heaven.That's why we need to focus on the more pressing things like Paul said ,and fight the good fight of faith.In this,our reward is sure. God bless you Ma. What I've to show for following Christ is the number of souls I have won for him. The people I've helped and how many times I've brought his word to non-believers. Wealth is nothing to show that you're a follower of Christ. The Bible says that we should lay our treasures in heaven because the things of the world passes away. What we have to show for following Christ is a question that is very difficult to answer. We shouldn't follow God for material things as these things come abundantly to us when we serve him and willingly obey his words. Curious about what you will mention if asked to. Kindly oblige me. Thank you Sir, but can there be a more straight answer to the question? I say this because many who are not Christians today, may present wealth as their gain for not following Christ. What will you as a Christian present as a tangible evidence? Faith is tangible, even though we can't touch it. The blessed hope of the believer, that we are not afraid of death because it will usher us into an eternity of bliss with the Lord, remains the greatest thing to show for being Christians. You are lifted in Jesus' name. Because I am a follower of Christ doesn't mean that my life will be all rosy. If I am with Christ for earthly benefits, I am heading for a terrible end and should be pitied. No matter how that question is posed God will always help me to give an answer. I love this! Being a Christian entails living the life style/type of Christ. A life that is worthy of emulation. A life that is good. Jesus frequently offered a simple invitation: “Follow me. ” What did he mean by that? He was inviting the faithfuls to go with him, to stay with him as he journeyed teaching and healing. The invitation is offered as an opportunity to learn from Jesus how to live authentically. The beautiful life Jesus lived—marked by a passionate love for God and a compassion for people, is something we can learn. Beautiful! This question is really thought-provoking. In our world today, many people follow Christ because of the benefits or material things they would get neglecting the crown of righteousness which is the most important. Paul lived an exemplary lifestyle which men should emulate. He fought the good fight of faith. He finished his course. He was sure of getting the crown of righteousness that awaited him. God bless you Sir. 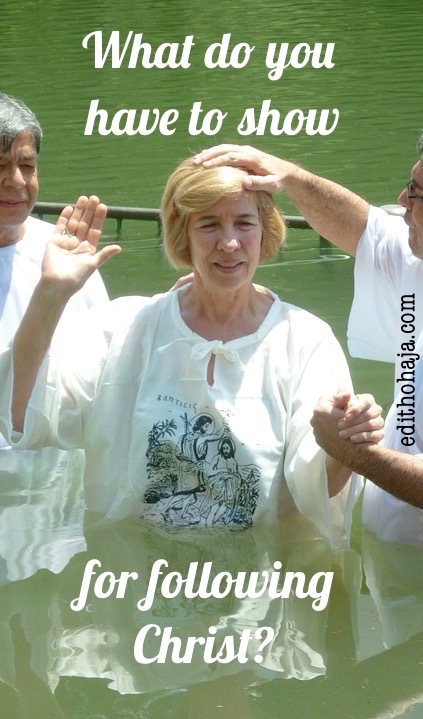 I'm really touched by this great post on faith. As believers we should always have in mind that after everything, only the kingdom of God should be our utmost priority where ever we find our selves and we should endeavour to achieve it. Thank you ma for making me to understand the major achievement a believer ought to long for and show as being one. We are candidates of Christ, here on earth to fulfill the word of God. I have onetime asked myself such a question but all I could give to myself as an answer is that I love Jesus and following Him gives me peace,joy and most of all,I want to come in contact with Him,face to face,so, I have to strive to do His will. Thanks,this post has enlightened me more. I follow Christ because he is my creator. He has given me every reason to stay on his lane.i am alive ND grateful.i just hope the Lord gives us grace to worship him for the right reasons. Thank you sir for a grace filled post. Most people don't understand that there is more in being a believer. We all should leave this vain world and aim for a "crown if righteousness". This article is a nice piece as well a reminder to Christians of what we really have to show for. If we are consumed by the desires of earthly wealth or having a misconception of chtistianhood. It is like a sword thrown direct to the heart of man. We should examine our faith dear brothers and sisters if it is in line with God's will. Being a Christian entails living the life style/type of Christ. A life that is worthy of emulation. A life of Christ . Knowing Christ is one thing and following him is another thing. We should follow Christ and we should emulate him by living an exemplary life fit for others to imitate. I think this is lingering question that we should answer. we should do the will of God so that we can inherite this place which our lord Jesus Christ have prepared for us. We should our selves this great question in our every activities. Thank you Ma'am for this post. I really thought that wealth and other earthly possessions are things we have to show for serving God. Our following God show not be actually on earthly things, our focus as Christians should always be on life eternal and mostly we should consider ourselves not as slaves unto sin anymore but as people of signs and wonders. If we believe and know who we are following; we shouldn't be dismayed to answer the world when they ask us of our gain in following Jesus because the ways of the unrighteous may always prosper but their ends are always of a sudden.. Psalms 73:1-9. Our answers to them should be reflected in our character daily by living righteously with God as our priority. Really good peice Many people still dont know that there is more to being a Christian. Christian race is an heavenly race so for me if someone should ask me what do i have to show for following Christ my answer would be "heaven, meet me there"
If the evidence of following Christ in you is material or earthly things then you have not started. The Bible says we should put all our affection on things above not on things here on earth. Whatever you have acquired is not an evidence cause others that have not experienced Christ also have them, rather use that in which you think that you have acquired for the work of God. Nice post on what do you have to show for following Christ? It is good we serve God in truth and in spirit (John 4:23-24). We should preach the gospel wherever we are and live an exemplary life to others people. What then shall separate us from the love of God? Shall tribulation, or distress, or famine, or nakedness, or sword? No in all these things we are more than conquerors through him who loved us. 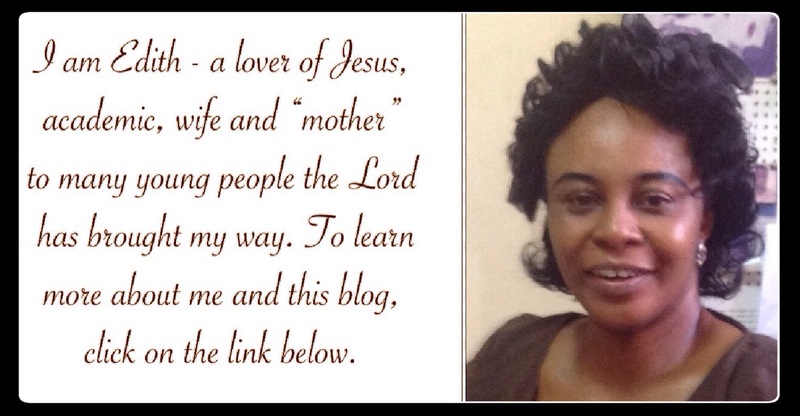 Thank you Aunty Edith Ohaja for this nice and wonderful post. This is very good question to think about,when we follow Christ,we do not expect to enjoy all through cause even Jesus said that we would face trials and tribulations.we have a commission given to us,so as Christians ,we should show we are his imitators. •ma really I'm so blessed by this great work,i learnt that we shouldn’t place physical and material blessings above our spiritual state.Thank u ma! As a follower of Christ we have to live an examplerary life. we should not have love for material things and also as a follower we should have faith in God. As Christians we have to give up certain things in order to truly follow God. One can be a Christian and still have a 'responsible' social life. Most people are religious and not christians.